Part Used & Method for Pharmaceutical Preparations: The root is dug in spring and autumn, dried in the sun, soaked in water and cut into pieces. Properties & Taste: Pungent, sweet and warm. Meridians: Lung, liver, spleen and urinary bladder. Functions: 1. To release the exterior and expel wind; 2. To expel wind-dampness and alleviate pain; 3. To alleviate spasms. 1. Wind-cold exterior syndrome manifested as fever, chills, headache and general pain. Ledebouriella root (Fangfeng) is used with Schizonepeta (Jingjie) and Notopterygium root (Qianghuo). 2. Wind-heat exterior syndrome manifested as fever, sore throat, red eyes and headache. Ledebouriella root (Fangfeng) is used with Schizonepeta (Jingjie), Scuteliaria root (Huangqin), Mentha (Bohe) and Forsythia fruit (Lianqiao). 3. Wind-cold-damp bi syndrome manifested as joint pain (arthritis) and spasms of the limbs. 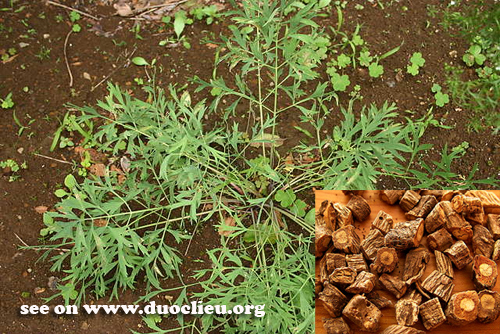 Ledebouriella root (Fangfeng) is used with Notopterygium root (Qianghuo) and Chinese angelica root (Danggui). 4. Urticaria and itching of the skin. Ledebouriella root (Fangfeng) is used with Flavescent sophora root (Kushen) and Cicada slough (Chantui) in the formula Xiaofeng San. 5. For German measles, pruritus, and other skin problems, it is used with Herba Schizonepetae Tenuifolia (Jing Jie) and Fructus Tribuli Terrietris ( ji Li). 6. For arthralgia due to Wind Cold Dampness with joint pain and muscle spasms, it is used with Radix Angelicae Sinensis (Dang Gui), Rhizoma Notopterygii (Qiang Huo), Rhizoma Arisaematis (Tian Nan Xing), Rhizoma Gastrodiae (Tian Ma), and Rhizoma Typhonii Gigantei (Bai Fu Zi). 7. For tetanus with opisthotonos, lockjaw, convulsions, and spasms, it is often used in combination with Rhizoma Arisaematis (Tian Nan Xing), Rhizoma Gastrodiae (Tian Ma), and Rhizoma Typhonii Gigantei (Bai Fu Zi), in a formula such as “Yu Zhen Powder” (Yu Zhen San). Dosage: 3-10 g, decocted in water, or in pills and powder form for internal use. Cautions & Contraindications: Use cautiously on patients with endogenous Wind due to Blood Deficiency or hyperactivity of Yang due to Yin Deficiency.